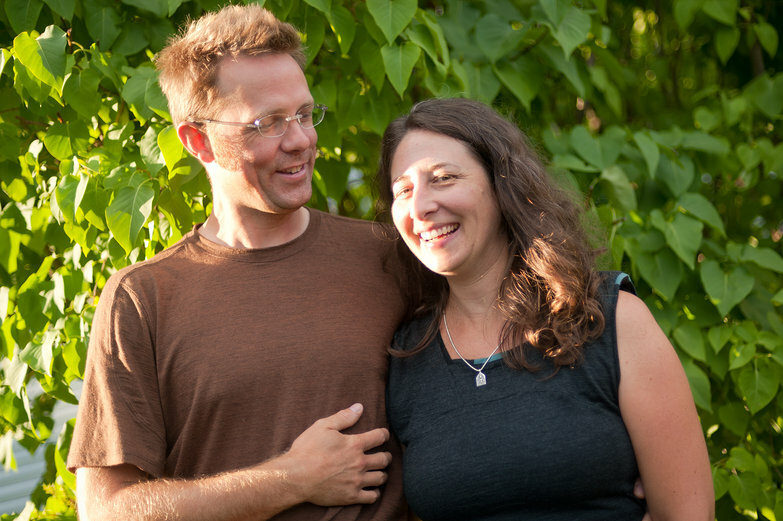 After land-hunting our way through most of western Vermont, we ended in the state's largest city, Burlington, at the home of Sheila and Kai, the thoughtful, socially-aware, and environmentally-conscious couple behind the website, 2cycle2gether. 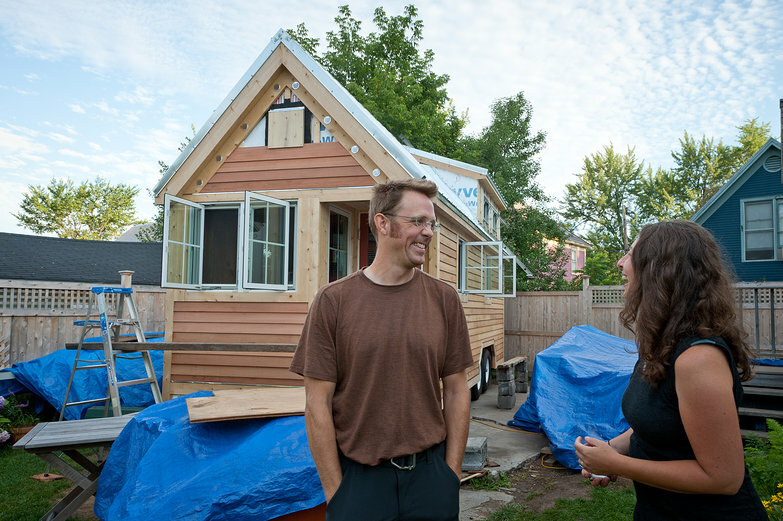 We've been following the pair for months, reading with great interest as they write about their upcoming world-cycle tour, and film the construction their own tiny house. We'd never met, but they greeted us like old friends, and we immediately began sharing stories with one another. Over water, and then wine, and then a dinner of Vietnamese food at a nearby restaurant, we took turns mining each other for information, them about long-term cycle touring (they are still in the preparation stages of their world tour), and us, about tiny homes and sustainable building. It was fantastic to finally meet them, and to find, once again, a pair of kindred spirits thanks to the power of the internet. 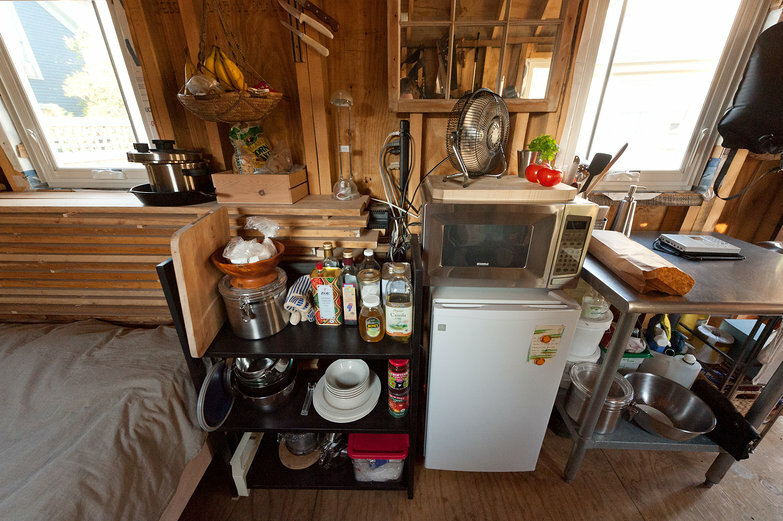 I'd heard of "tiny houses" and I'd seen many photos of the minuscule, smartly-designed dwellings, but no matter how much I read about and appreciated the sensible concept, the idea was always firmly relegated to the camp of "cool, but not for me". As it turns out, I wasn't prepared for how it felt to actually be in one. They're actually pretty fantastic! It was completely unlike the cramped experience I was imagining; I must say it felt… spacious! (It looks even more roomy thanks to our wide-angle lens.) 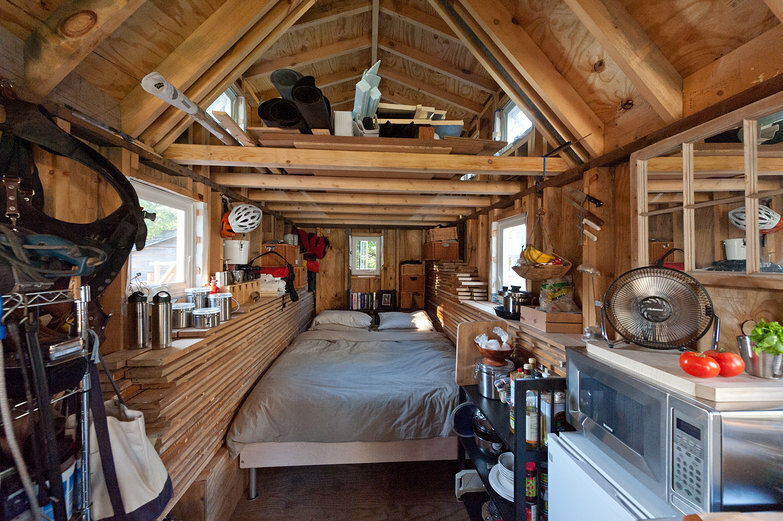 Once Sheila and Kai finish the loft, their bed will go up there, and the boards stacked up against the walls will be gone, creating even more room. Their little kitchen, complete with marine alcohol oven, seemed functional and comfortable, too. Spending time in Sheila and Kai's home has led me to completely re-think the concept of tiny dwellings. I'd still prefer to sculpt our house, but it is great to have some experience-based perspective about this style of home. It's freeing to know that I really could be totally comfortable living in such a space. Good luck with everything you two! We'll be following along! What a wonderfully serendipitous world it is, to have you both end up here in Vermont for a visit, just before we head out on our own travels by bicycle! We've followed your blog for years & it often helped keep the dream of cycling around the world alive in our hearts. We really loved meeting you, will be anxiously following your homesteading adventure from the road, and look forward to future dinners where we ramble on about all-things with you.